Every day we all see, hear or think of things we need to remember. Usually we grab a pad of sticky-notes, scribble a reminder and put it on the desk, the fridge or the relevant page of a magazine. Unfortunately, if you’re like me you probably often discover that the desk, fridge or magazine wasn’t such a clever place to leave the note after all...it’s rarely where you need it when you need it. What this guy says !!! Pleas dump this useless stuff or make it right, eg. Springpad is 10 times better! Stick to what's actually is good and important, Google Reader! For me the importantst Google Service! I need it more than Google Search or Gmail, because for them exists good alternatives. And yes, i'm an actual G+ User, you don't have to shut the reader down to bring me over. BTW G+ can't replace the Reader a tiny bit. Because what the world was lacking was ANOTHER note taking app... Oh no wait, better news services is what the world is sorely lacking. You already did this once. It was called Google Notebook. You killed it like so many other services. I took my notes to Evernote. I see no reason why I would go back to Google. Seriously!? I'd rather carry around a dumbphone and an actual notebook than trust Google at this rate. Did you guys even bother doing market research on this? Oh sure. After killing off Google Reader and Google Notebook we're supposed to start putting everything in Keep? Forget it. Evernote has my trust - Google does not. 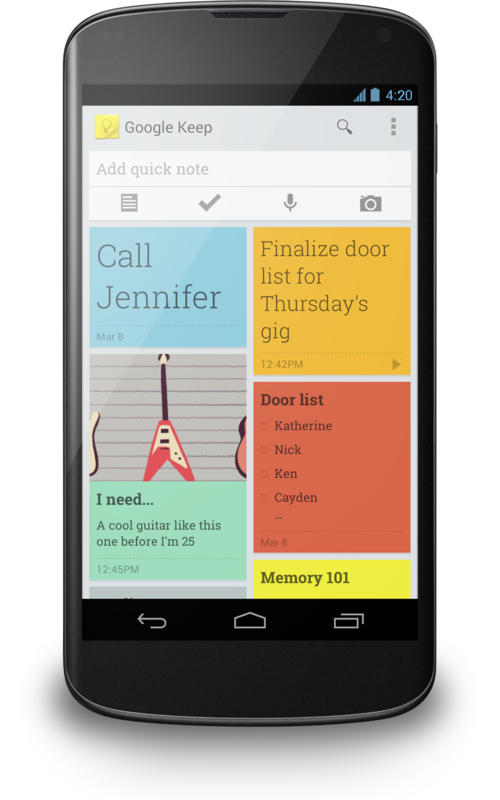 I am very reluctant to use this to store notes, thoughts or ideas because Google might kill the app to "focus on other things". I am going to focus on other companies, apps and services to keep myself and my data safe from capricious business blunders. I can't wait to leave my current note taking service (that I started to use after google killed Notebook) for couple of years, then go back to it once you guys shut down that one because it doesnt replicate any facebook feature. Seriously.